Andrea Cremer spent her childhood daydreaming while roaming the forests and lakeshores of Northern Wisconsin. She now lives in Minnesota, but she thinks of her homeland as the “Canadian Shield” rather than the Midwest. Andrea has always loved writing and has never stopped writing, but she only recently plunged into the deep end of the pool that is professional writing. When she’s not writing, Andrea teaches history at a liberal arts college in St. Paul. Learn more at Andrea Cremer’s website. 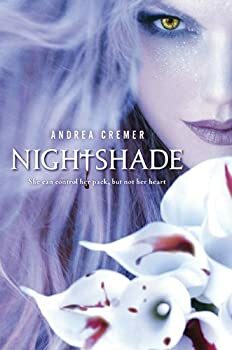 Nightshade is yet another addition to the burgeoning YA paranormal genre, but stands out for several reasons, including its creative premise. It centers on the Guardians (essentially werewolves but with a few vampire traits as well), who are powerful compared to humans but are themselves enslaved by a race of witches called the Keepers. The Keepers rule most of the world from behind the scenes. But in Vail, where 17-year-old Guardian Calla Tor lives, their dominance is overt.